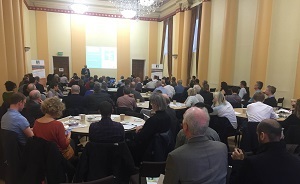 We communicate and engage regularly via the MiM Public Meetings held in Macclesfield, alternating between morning meetings at 7.45am until 9.30 am and evening events at 7.30pm. The aim of these breakfast is to provide input, have debate and listen to views and we focus on the areas that matter to the people of Macclesfield. There is a candid, straight forward approach and everyone is welcome. We just need to know if you are coming because the room size is restricted. We often hold them in the Town Hall and have recently been at the rugby and football clubs. Please see the past presentations. We also endeavour to put the agenda on the website, please recognise that these may change at the last minute. For more information on MiM Public Meetings, sign up to our mailing list. Venue: Charles Roe Room, Sunday School, Roe Street. Venue: Macclesfield Town Hall Assembly Rooms. The slide deck from this meeting is available HERE. The MiM live tweets thread can be found HERE. A fuller report will be posted when available.